MSU Codec Comparison aims to deliver high quality comparisons of video encoders to both industrial and scientific communities. Since 2003 our team publishes annual reports with codecs’ comparisons. For both platforms we considered three key use cases with different speed requirements. Comparison of more than 30 video codecs on several sequences and with different parameters. Comparison of 15 lossless codecs in RGB, YUV2, YV12 colorspaces. 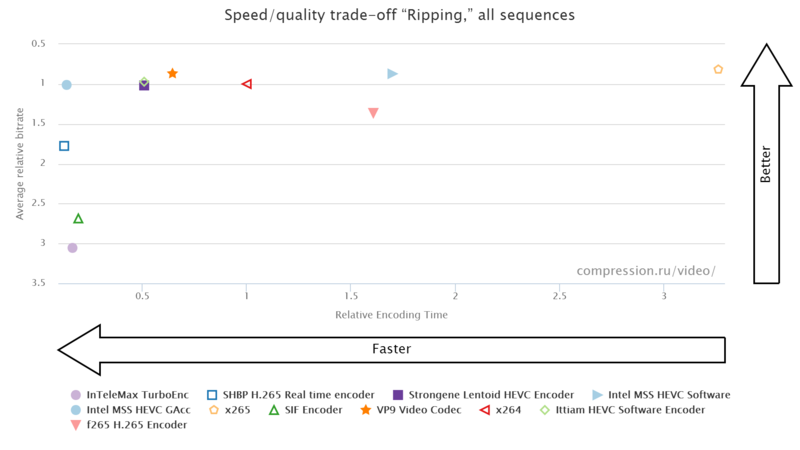 The newest versions of MPEG-4 codecs comparison for their using by an ordinary user for home video compression. Also shown the evolution of the DivX codec. Many JPEG 2000 codecs and one JPEG codec are compared. Difference between several implementations of the standard is shown. Comparison of 6 codecs with default parameters. Second annual H.264 codecs comparison. Comparison of 8 codecs. Four modern codecs were tested using SAMVIQ method (experts estimated video quality without information about the codec that was used). 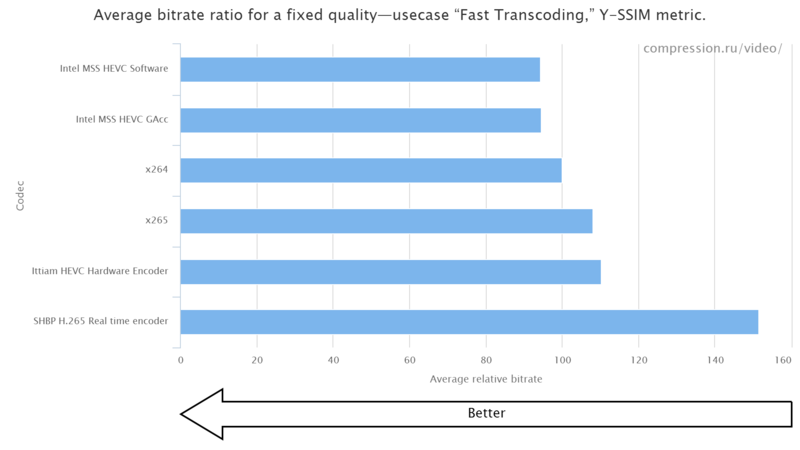 Comparative analysis of quality of 8 MPEG-2 decoders while decoding distorted streams. This question is topical for satellite broadcasting and, to a lesser degree, for DVD video playback. Earlier tested image codecs of JPEG 2000 standard (see JPEG 2000 image codecs comparison) are comparing with new WMP standard from Microsoft. Third annual H.264 codecs comparison. Additionally to traditional comparison of this year codecs, over-years comparison was performed (comparison of all tested last three years codecs). 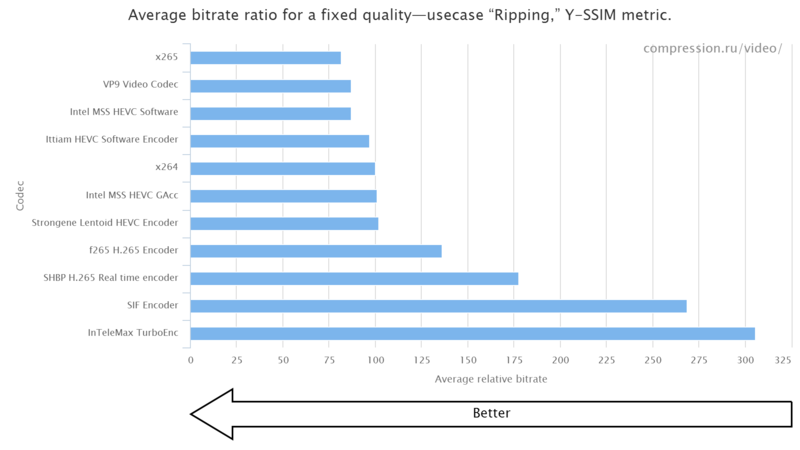 Comparison of 16 modern lossless video codecs was performed. Report includes the following topics: compression ratio analysis, speed analysis and parallelization capabilities. Fourth annual H.264 codecs comparison. Additionally to traditional comparison new type of analysis with synthetic sequences was performed. Also new sequences, new codecs, new presets were used in this comparison. Options of one of the best codecs x264 are analyzed to find best option values and best presets for various encoding speed. Fifth H.264 codecs comparison. New types of analysis, new sequences, new codecs, new presets were used in this comparison. Sixth H.264 codecs comparison. New sequences, new codecs and new presets were used in this comparison. Seventh H.264 codecs comparison. New sequences, new codecs and new presets were used in this comparison. GPU-encoders comparison. New quality metrics. Eighth H.264 codecs comparison. New HDTV and Videoconference sequences, new codecs and new presets were used in this comparison. GPU-encoders comparison (including Ivy Bridge and NVIDIA platforms).